They are all criminals for simply crossing the border illegally/overstaying their visas. The minimum penalty is a small fine and deportation, per federal law. How many of them are involved in identity theft in order to work? How many commit misdemeanors like driving while intoxicated? Driving without a license and/or insurance? The very fact is that federal law says they shouldn’t be here. You can bet these same ICE deranged Democrats would have you arrested if you trespassed on their own property. Every day they’re here they’re breaking the law. 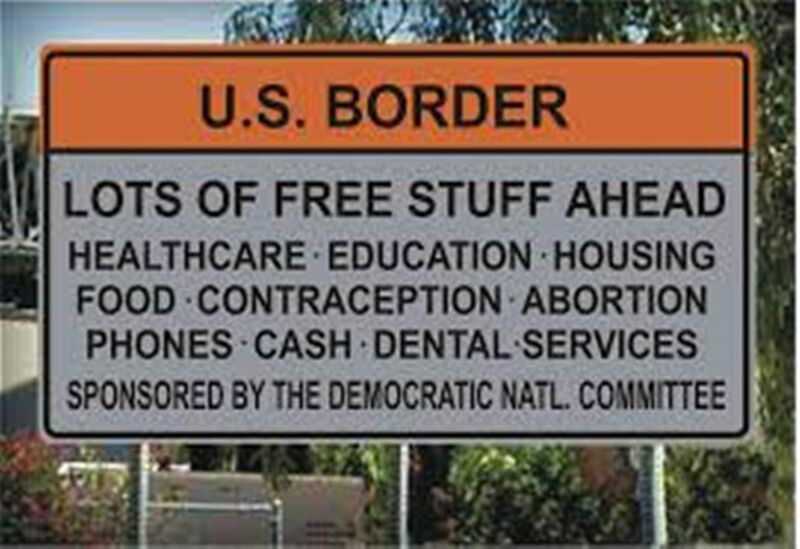 Everything Democrats do is to incentivize illegal immigration. The thing is, that reduction in beds would actually mean that as many as 8,300 criminal illegal aliens, the ones who have committed serious crimes, would have to be released. Release them at the homes of Democratic lawmakers. This entry was written by William Teach and posted on at 7:32 am and filed under Democrats, Illegal Immigration. Bookmark the permalink. Follow any comments here with the RSS feed for this post. Just because tRump is a hypocrite for hiring illegal workers (he still employs many) doesn’t mean he is wrong on immigration, although he is. His bombast directed at immigrants is a ruse to fire up his xenophobic base. Why did tRump choose immigration as America’s most daunting problem, ignoring global warming, the widening gap between rich and poor, flat wages, massive debt…? He correctly saw that 35% of the population would follow him no matter what, as long as he agreed with them on minorities, abortion, science and religion. Harvey is beating the drum for something nobody but Yahoo News cares about, plus the fact he has yet to prove Trump is personally responsible. Why did tRump choose immigration as America’s most daunting problem, ignoring global warming, the widening gap between rich and poor, flat wages, massive debt…? Because most of the rest of the public sees it that way. The public is ignoring global warming because they see it’s a scam and Trump is closing the widening gap between rich and poor, getting people back to work, and doing as much as he can to fix the massive debt Zippy and the Demos gave us until Social Security and the rest of the entitlements collapse. He correctly saw that 35% of the population would follow him no matter what, as long as he agreed with them on minorities, abortion, science and religion. Well, those are American values he espouses and that 35% (her’s doing better than Zippy was at this point in his Maladministration) is his floor. He will not go below it and he keeps building on it every day. All the Demos have a ceiling, but there’s no limit to how low they can go. Let’s see-complain about the gap between the rich and poor while at the same time criticizing Trump for focusing on illegal immigration. Of course, letting in more of the un-educated and low skilled will simply increase that said gap, but we’re dealing with liberal economics so that’s no big surprise. And still waiting to hear what the “daunting problem of global warming” is. Will tRump shut down the gov’t again in a snit? Maybe! Perhaps he will sign a bill keeping the gov’t open but then declare a fake national emergency. The snit is Pelosi Galore’s, along with most of the rest of the loonies. Trump tried to make a deal and the Demos, as Teach notes, went looking for an excuse to turn it down. He has a legal right to declare a national emergency, thanks to a bill the Demos passed. And I still don’t see many Americans complaining about the Feds shutting down.